1. a small area or spot; the sharp end of an object. 2. to approach the surface, like the pus of an abscess, at a definite spot or place. 3. a tapered, pointed endodontic instrument used for exploring the depth of the root canal in root canal therapy; called also root canal point. point A a radiographic, cephalometric landmark, determined on the lateral head film; it is the most retruded part of the curved bony outline from the anterior nasal spine to the crest of the maxillary alveolar process. absorbent point in root canal therapy, a cone of variable width and taper, usually made of paper or a paper product, used to dry or maintain a liquid disinfectant in the canal. Called also paper point. point B a radiographic, cephalometric landmark, determined on the lateral head film; it is the most posterior midline point in the concavity between the infradentale and pogonion. boiling point the temperature at which a liquid will boil; at sea level the boiling point of water is 100°C (212°F). 1. the points on the different refracting media of the eye that determine the direction of the entering or emerging light rays. 2. four points within the pelvic inlet— the two sacroiliac articulations and the two iliopectineal eminences. craniometric p's the established points of reference for measurement of the skull. dew point the temperature at which moisture in the atmosphere is deposited as dew. far point the most remote point at which an object is clearly seen when the eye is at rest. 1. the point or object on which one's sight is fixed and through which the axis opticus passes. 2. the point on the retina, usually the fovea, on which are focused the rays coming from an object directly regarded. freezing point the temperature at which a liquid begins to freeze, for water, 0°C (32°F); it is often used interchangeably with melting point, but should be used for substances being cooled while melting point is reserved for substances being heated. ice point the true melting point of ice, being the temperature of equilibrium between ice and air-saturated water under one atmosphere pressure. isoelectric point (pI) the pH of a solution in which molecules of a specific substance, such as a protein, have equal numbers of positively and negatively charged groups and therefore do not migrate in an electric field. J point on an electrocardiogram, the junction between the end of the QRS segment and the beginning of the ST segment. jugal point the point at the angle formed by the masseteric and maxillary edges of the zygomatic bone; called also jugale. lacrimal point a small aperture on a slight elevation at the medial end of the eyelid margin, through which tears from the lacrimal lake enter the lacrimal canaliculi. See also lacrimal apparatus. point of maximal impulse the point on the chest where the impulse of the left ventricle is sometimes felt or seen most strongly, normally in the fifth costal interspace inside the mammillary line. McBurney point a point of special tenderness in appendicitis, about 4 to 5 cm from the right anterior iliac spine on a line between the spine and the navel; it corresponds to the normal position of the appendix. 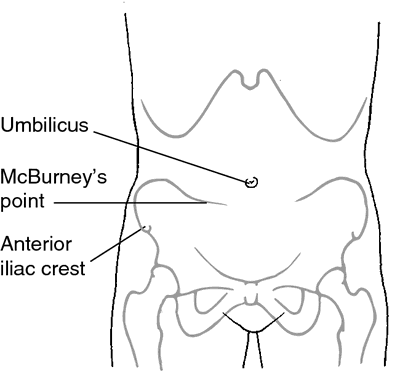 McBurney's point is located midway between the anterior iliac crest and the umbilicus in the right lower quadrant. From Ignatavicius and Workman, 2002.
melting point (mp) the minimum temperature at which a solid begins to liquefy; see also freezing point. near point the nearest point of clear vision, the absolute near point being that for either eye alone with accommodation relaxed, and the relative near point being that for the two eyes together with employment of accommodation. nodal p's two points on the axis of an optical system situated so that a ray falling on one will produce a parallel ray emerging through the other. 1. a point of extreme sensitivity to pressure. 2. one of various locations on the body at which digital pressure may be applied for the control of hemorrhage. Locations of pressure points. Shaded areas show the regions in which hemorrhage may be controlled by pressure at the points indicated. root canal point point (def. 3). silver point in root canal therapy, a tapered and elongated silver plug that is cemented into the canal as a filling. Called also silver cone. 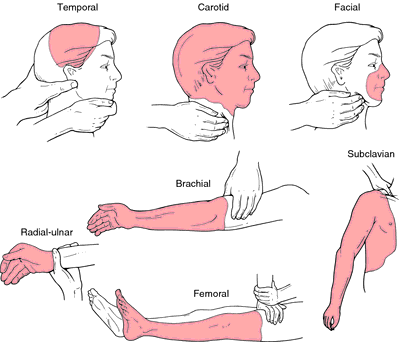 trigger point a spot on the body at which pressure or other stimulus gives rise to specific sensations or symptoms. triple point the temperature and pressure at which the solid, liquid, and gas phases of a substance are in equilibrium. the point on the retina at which the rays coming from an object regarded directly are focused. According to the company, the Pyrenees mono cervical plate system offers a slim-profile design that allows for a single point of fixation per level for improved visualization in-situ. Cementless implants with distal fixation have an advantage of bypassing the fracture site and having their point of fixation outside the area of injury. The fovea extends two degrees across the point of fixation.